Harrison Eidsgaard was the creative mind behing the creation of Irisha's unique interior. This full-custom yacht is reflective od Heesen’s DNA: she is a full-aluminium, semi-displacement motor yacht below the 500GT threshold that allows for fast cruising. 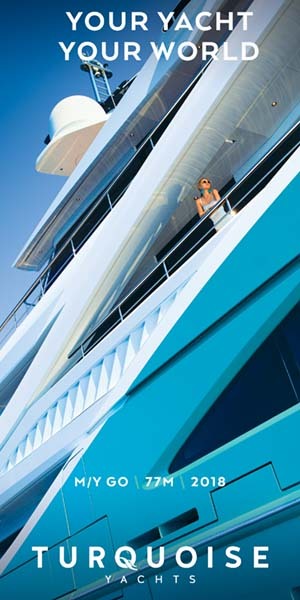 The yacht adheres to the owner’s requirements. The proven engineering platform of the 5000 Aluminium class offered the perfect opportunity to give carte blanche to the designers to create a radical profile and to deliver the safety of a proven and efficient hard-chine hull: the best of both worlds! As soon as you step onto the yacht, the interior design is inviting and relaxing with a neutral palette of beige, grey and blue. Walls and surfaces are covered with textured materials that catch and reflect the light in different ways creating a sense of warm luxury throughout the yacht. The architecture of the interior is emphasised by the accurate light design. Four different settings are conceived to draw the eye to the architectural and design elements, harmonising the design of each room, and creating different atmospheres at the touch of a button.